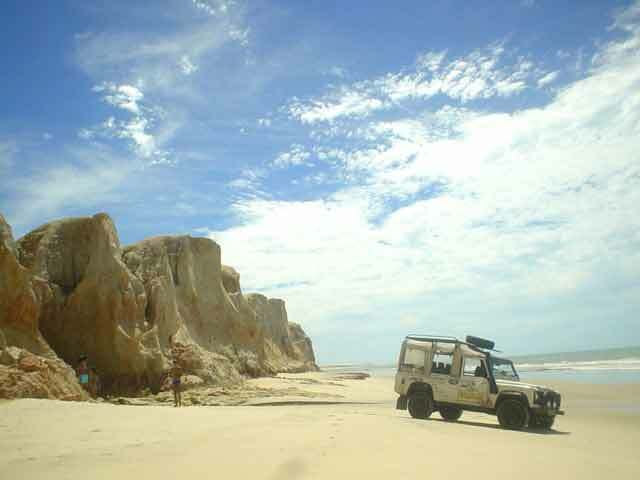 Day 1: From Fortaleza to Canoa Quebrada: off-road through the beaches. To better enjoy the day we leave as soon as the tide of the day allows us to drive on the beach. We begin by Porto das Dunas, famous for being home of the biggest water park in the whole Latin America. From there we begin to cross ceara�s Sunrise Coast, the east coast. We follow through Prainha, Praia do Presidio, where the portuguese built a jailhouse to put the Dutch who invaded this coast on the 1600�s. We keep on going, now we reach the fishermen village and handcraft place Iguape. Then Barro Preto, Batoque, Balbino and Caponga. 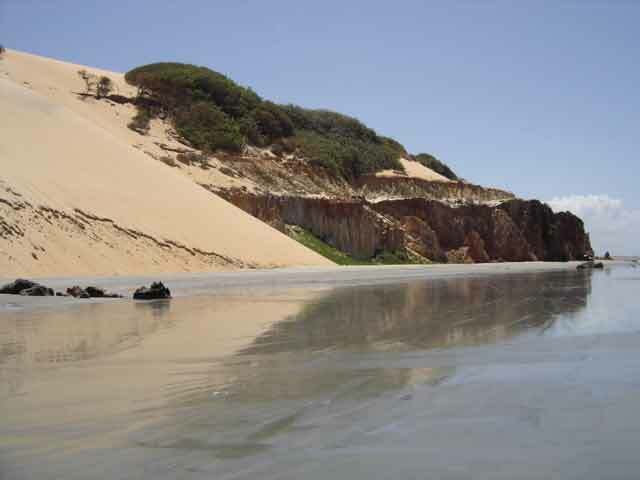 At Aguas Belas we cross our first "ferry boat" of the day, another boat cross in Barra Nova and we get to Morro Branco, where we can see the biggest attractions of this side of Ceara�s coast, the coloured sand cliffs and an incredible maze. We�ll see how the locals make art with those sands, then some fresh coconut water and we continue. Our trip goes on another spectacular beach, Praia das Fontes, with it�s fresh water dropping from the sand cliff�s fountains. A quick stop for some pictures and shower so we reach the most unexplored beaches of this coast, the villages of Piquiri, Arios, Prainha do Canto Verde, Paraiso and Parajuru. Here we must take the main road to get across the Jaguaribe River through it�s bridge that gives access to the historical city of Aracati the "city" of Canoa Quebrada. As we arrive in the hippies paradise from the 70�s we go down the sand cliff ang get to the beach (cars are not allowed at the beach in Canoa) for lunch right by the sea in one of the several local restaurants. As the day approachs to it�s end, we go on a ride over the Dunes, where we can sandboard or practice the local "ski-bunda" as we watch the sunset of this fantastic day from a privilleged view. After that a well diserved pousada to relax and enjoy the night in Canoa Quebrada�s main street, called Broadway because of it�s Bars, restaurants and beautifull little shops. Day 2: Ponta Grossa, Ceara�s hidden treasure. 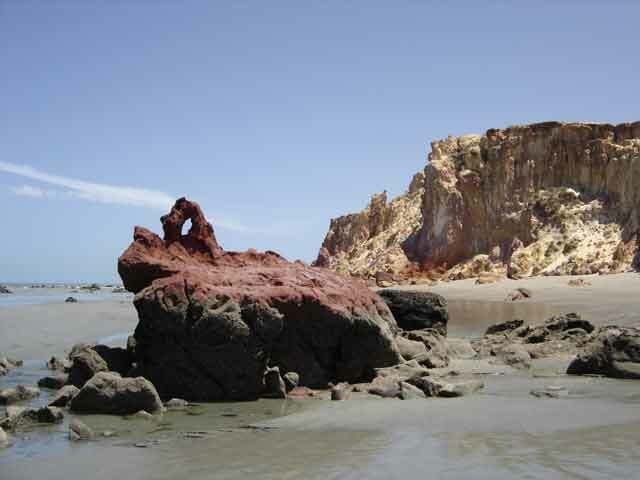 According to the tide tiime we leave Canoa Quebrada heading east, to visit one of the most beautifull pieces of coast. Sand Cliffs and rocks of various shapes and colours, some look made with the hand, others look hand-painted. All that with the local life almost untouched by the hands of the tourism industry. These beaches are home of the lobsters fishermen. Here we can taste their hospitality and wonderful cuisine. At Ponta Grossa, an area of environmental protection, we can see the descendents of the dutch invasors who tormented the portuguese. We�ll see a lot of blue-eyed blond-fishermen around. We can see the sunset from the top of the big dune and then go to the special pousada where we�ll spend this night. Day 3. Ponta Grossa - Fortaleza. Morning free to walk through the beuatifull beach and appreciate the calm life of the natives. Maybe a boat ride to fish our lunch. Return to Canoa Quebrada by the beach and then to Fortaleza.